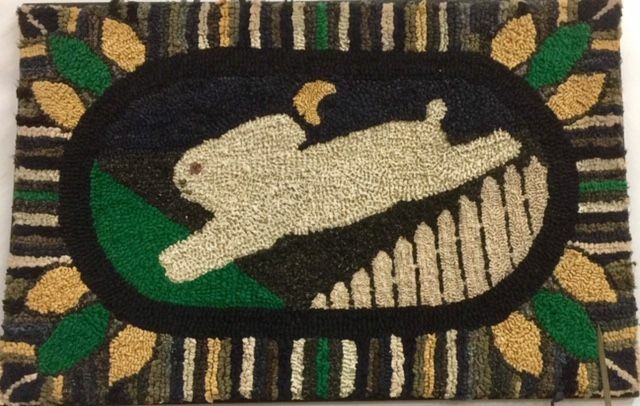 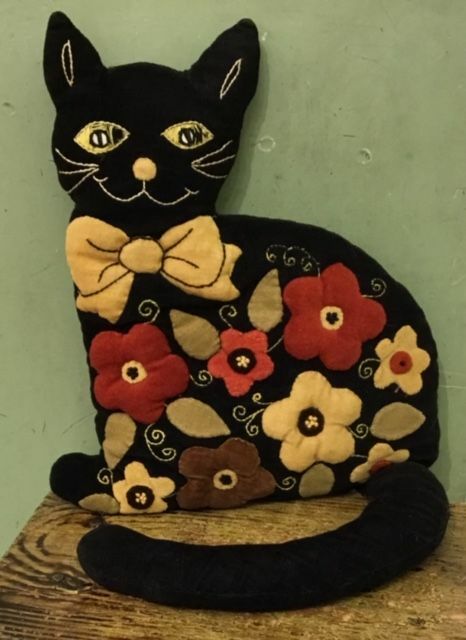 Rabbit hooked rug, leaping over the fence at night under the moon, circa 1920, wonderful bi-color wool used for the rabbit gives it great dimension, excellent condition, mounted for hanging, 35" x 23". 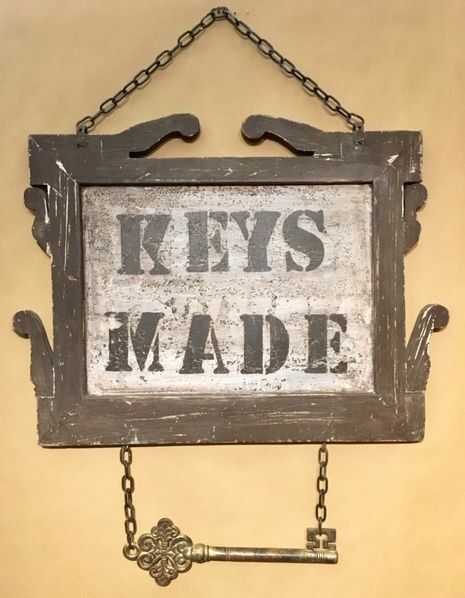 "Keys Made" trade sign including hanging key, circa 1920-30, two-sided with one side more weathered. 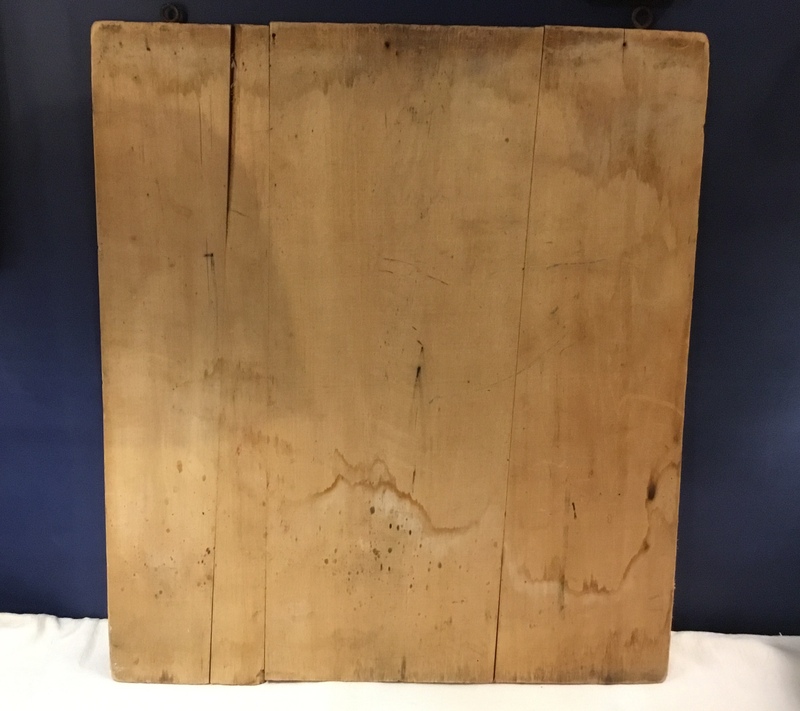 Sign alone 35" x 26 1/4"; with key 35" x 38 1/2". 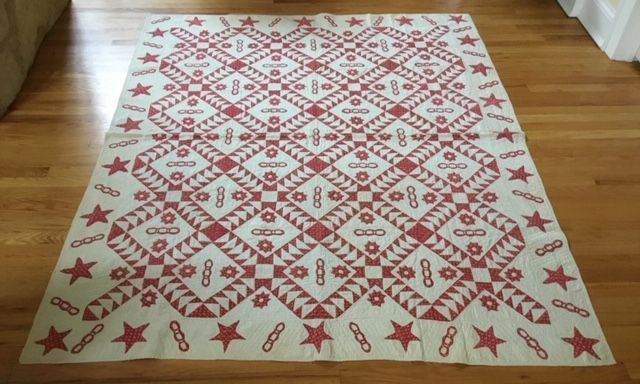 Odd Fellows/Odd Fellows Cross (Geese in Flight variation/Railroad Crossing variation) pieced and appliqu� quilt, 70" x 82". 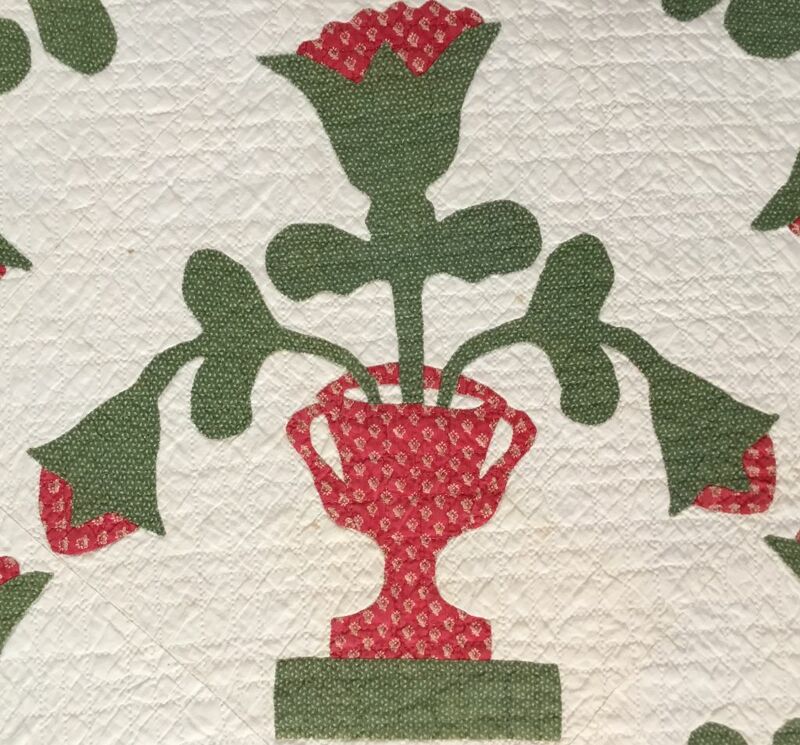 The print fabric is pre-1830: red ground with multi-colored flowers of chrome yellow, green, white, and blue. 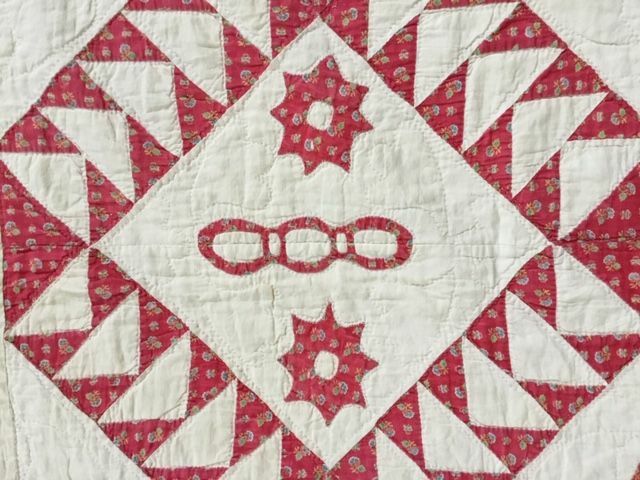 Quilt probably dates to mid-1800s. 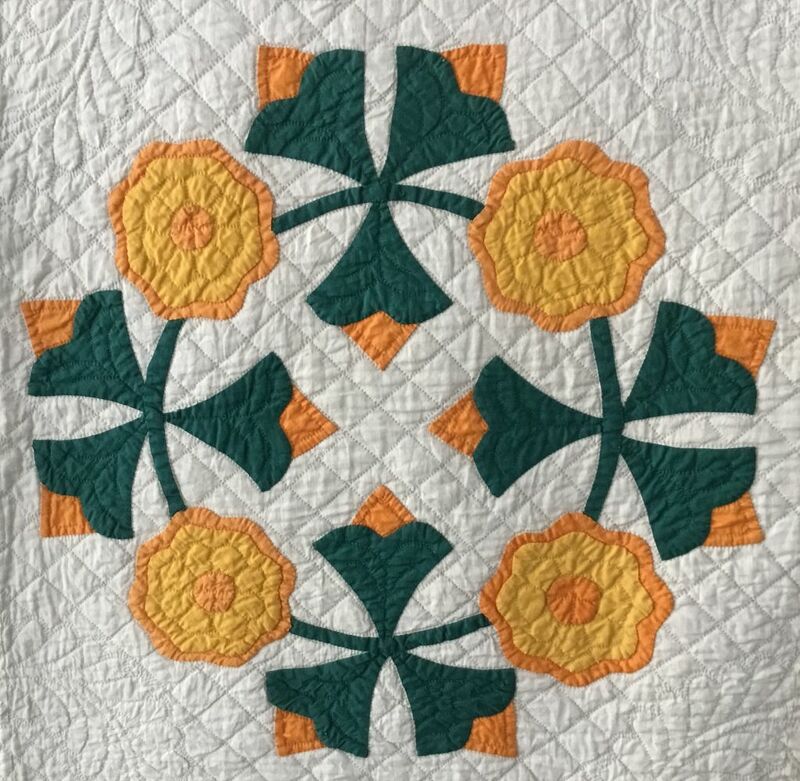 The interior appliqu� includes flowers and the Odd Fellow 3-links symbolizing Friendship, Love, and Truth, while the very effective border is composed of alternating stars and links. 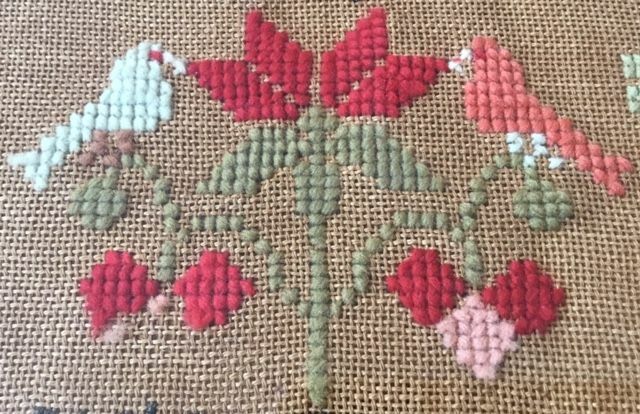 Very good condition with even mellowing of the red fabric. 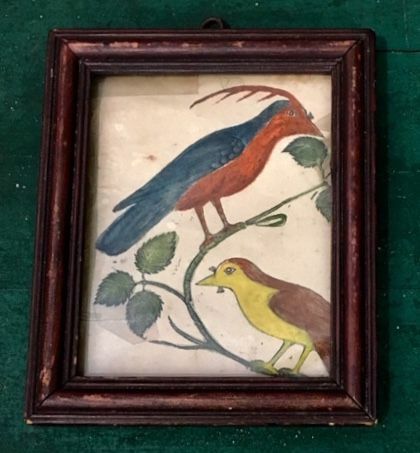 Hand-colored lithograph of birds, possibly a bookplate, original frame, early to mid-1800s, 5" x 6". 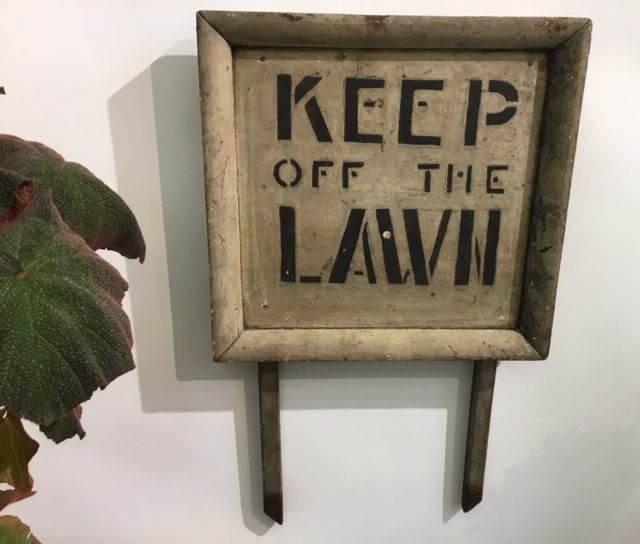 "Keep Off The Lawn" sign, wood, black letters on white, made to stick in the ground, circa 1940, excellent condition. 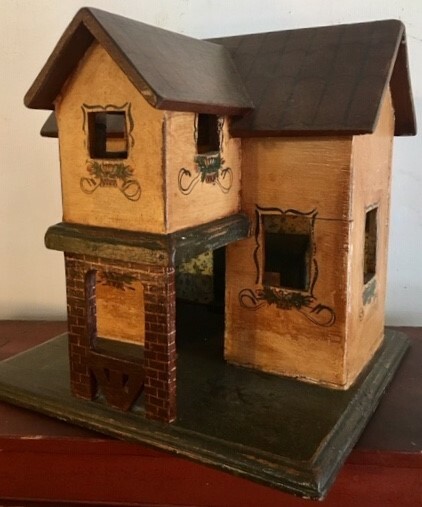 12" wide x 19 3/4" tall. 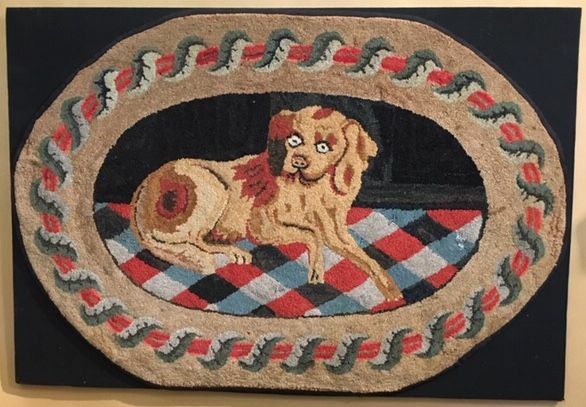 Hooked rug of a dog reclining on a rug, excellent, clean condition, mounted for hanging. 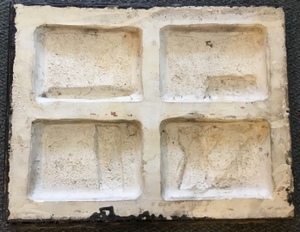 41 1/2" x 28 3/4". 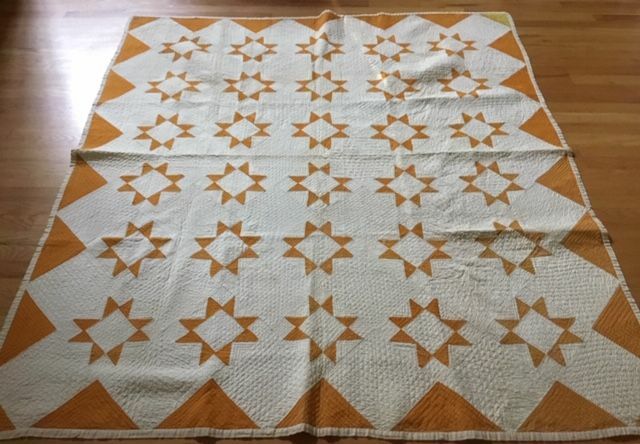 Cheddar and white 8-point star quilt, circa 1870, small scale pattern with zig zag border, nicely quilted, very good condition with color loss to one corner as shown (seen upper right in full view). 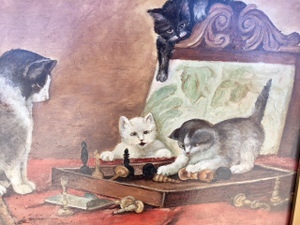 62" x 72". 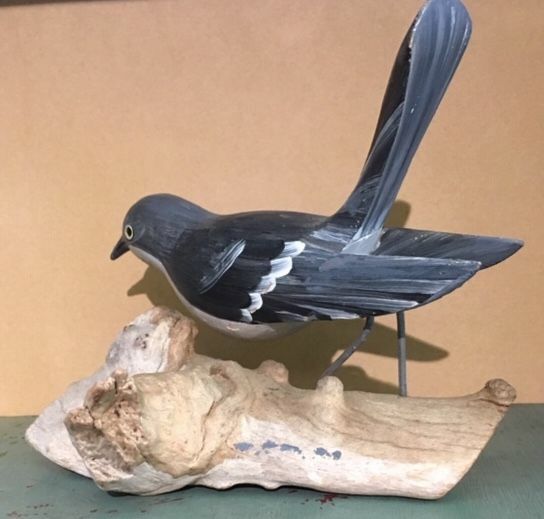 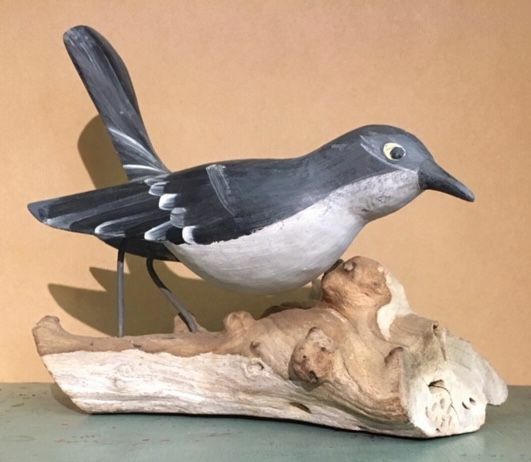 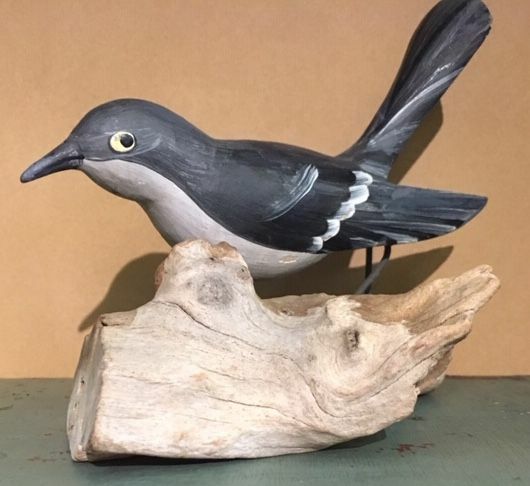 Hand-carved bird in original paint decoration, circa 1920-40, excellent condition, 5" tall x 6" long. 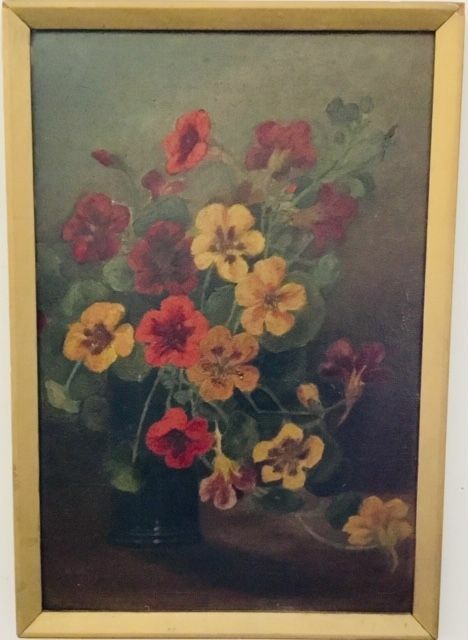 Oil on artist's board painting of nasturtiums in gold frame, excellent condition, 11" x 14". 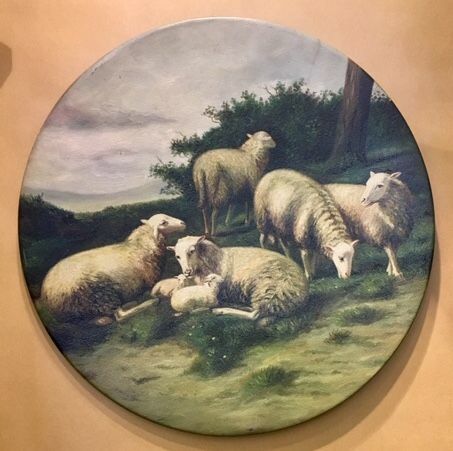 Oil painting on tin plate of sheep in pasture, circa late 1800s, 15 1/2" diameter, excellent condition. 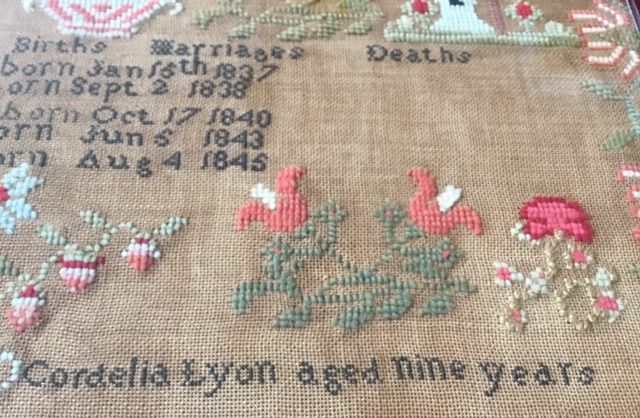 Family Record sampler, Lyon family, New York state, stitched by Cordelia Lyon, aged 9, 1847, excellent condition. 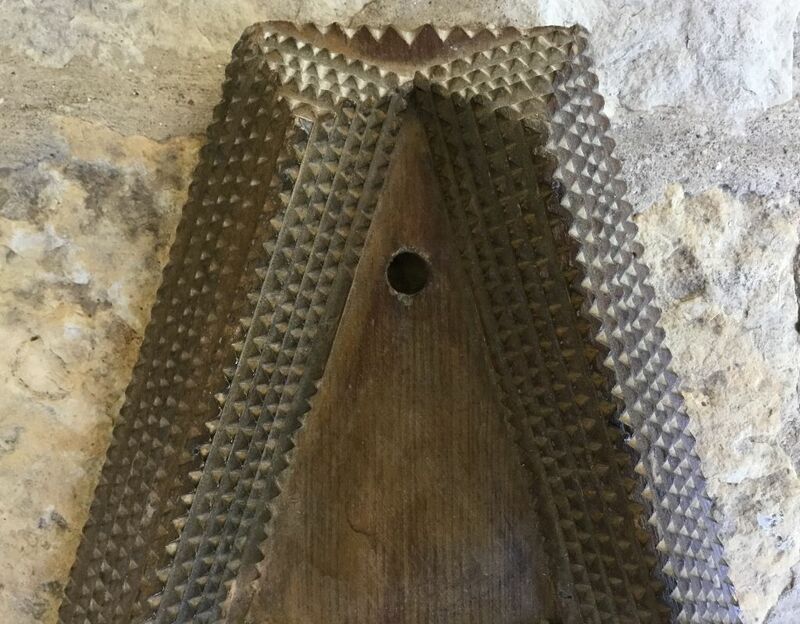 19 3/4" x 15 1/2". 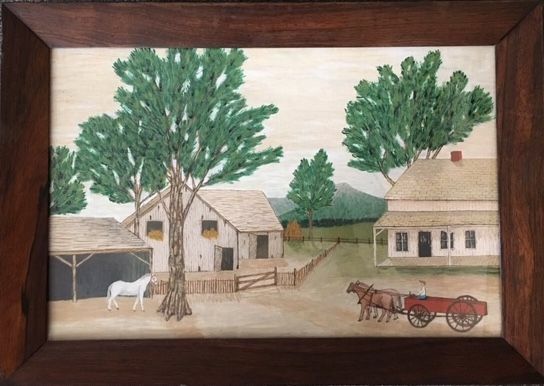 Some family history available to the buyer. 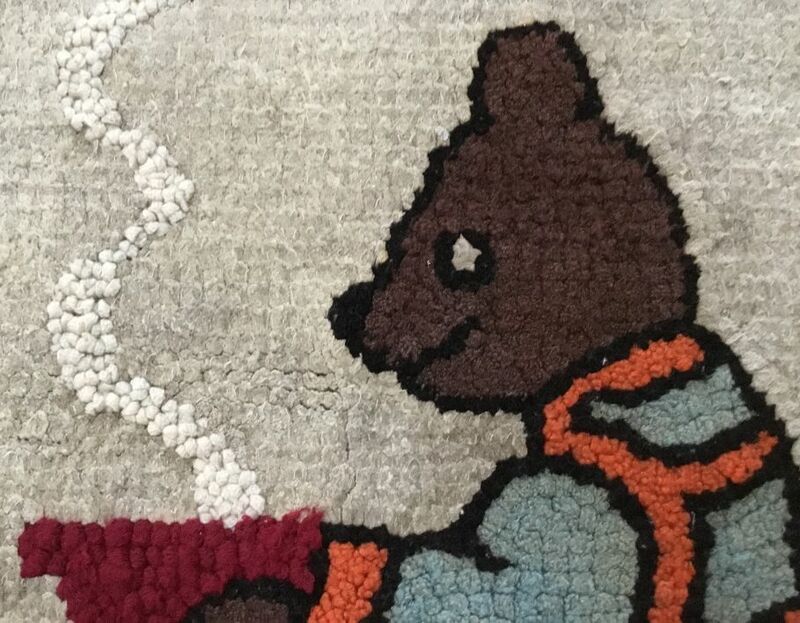 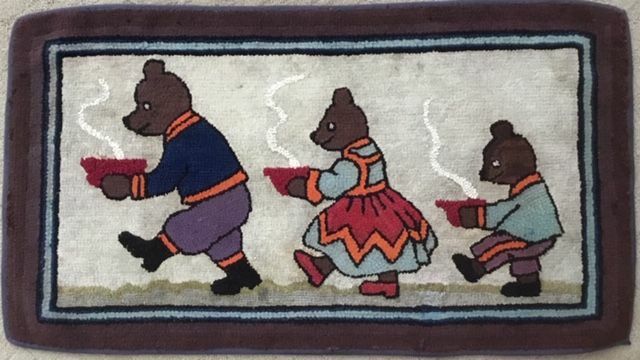 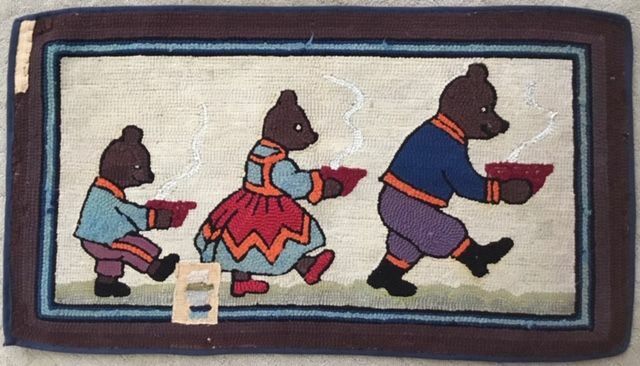 Three bears hooked rug, circa 1930, 39" x 22", great color, two small repairs as shown on back. 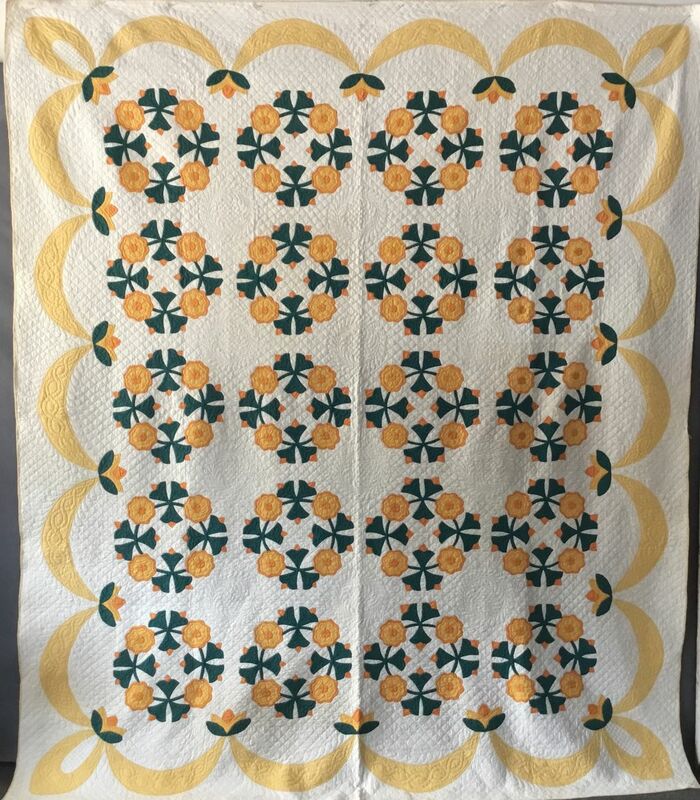 Rose Urn appliqu� quilt, circa 1860, probably Ohio origin, 82" x 84", wonderful graphic pattern with frame border inside a vining bud border. 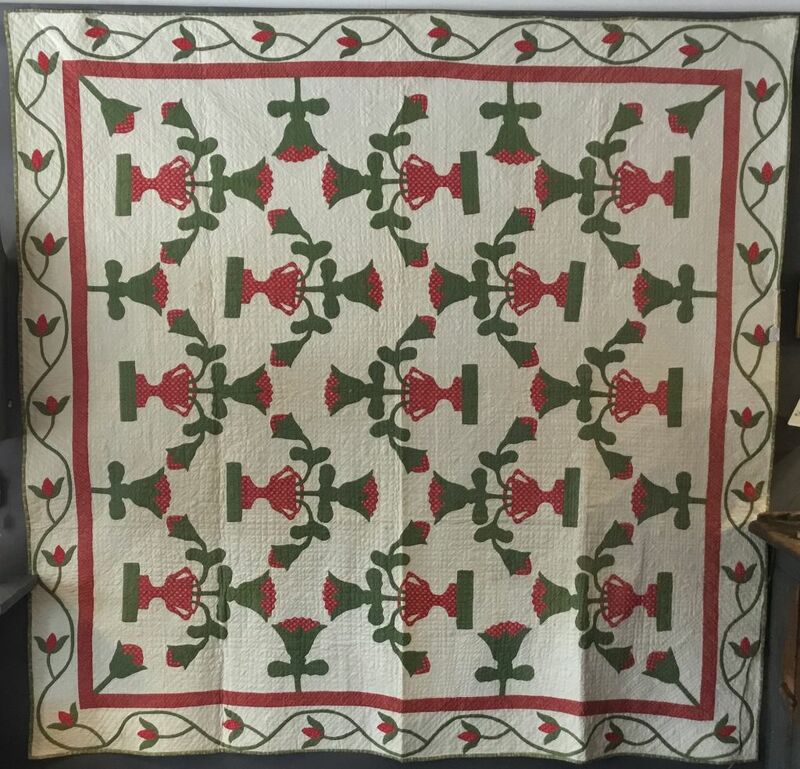 Excellent quilting and construction using two green print and three red print fabrics on a white ground. 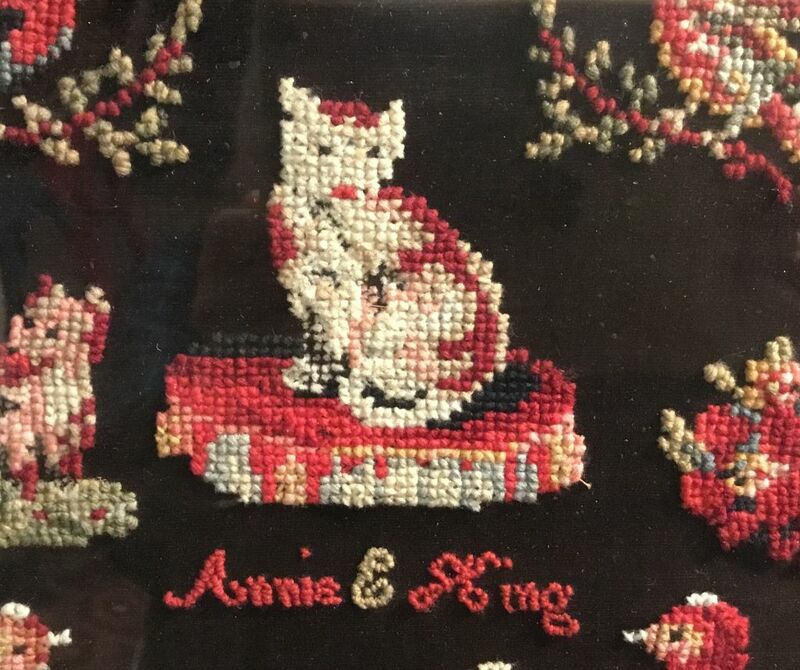 Very fine condition with popping to about 5% of one of the red print fabrics. 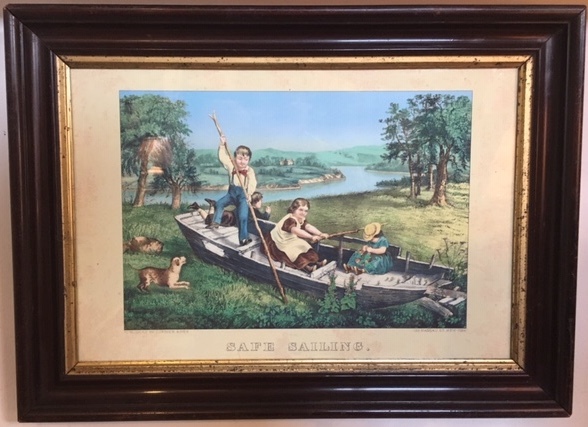 "Safe Sailing" Currier and Ives print in original frame, hand-colored, 21" x 15". 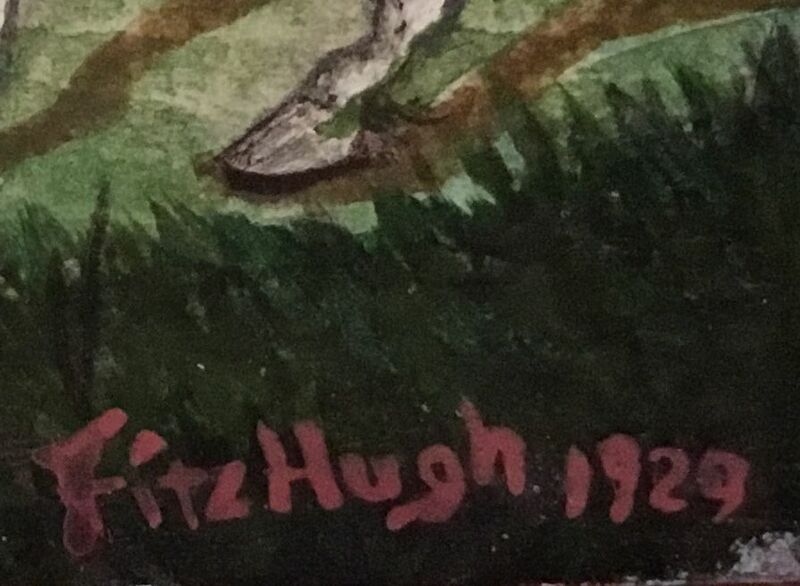 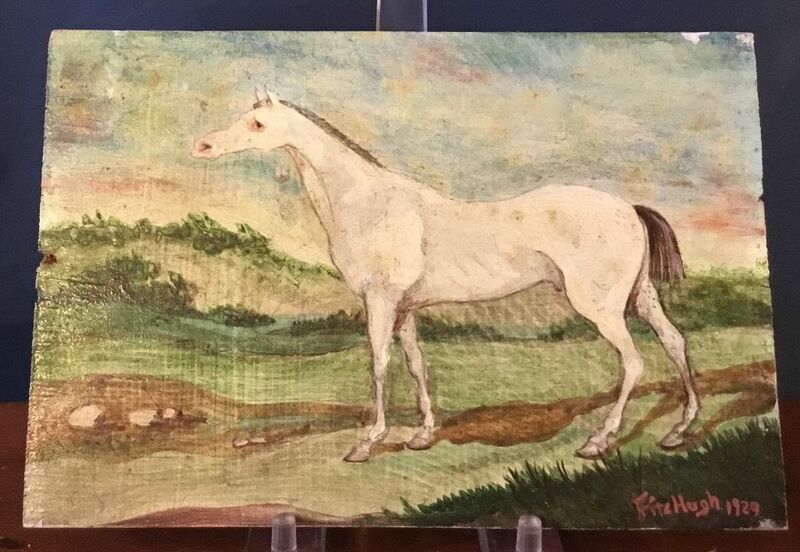 Small horse painting, oil on a board, signed "Fitzhugh 1929", 4 7/8" x 7". 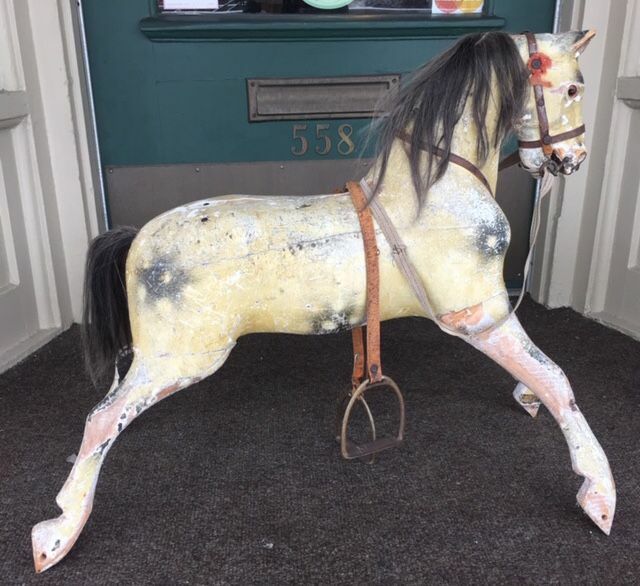 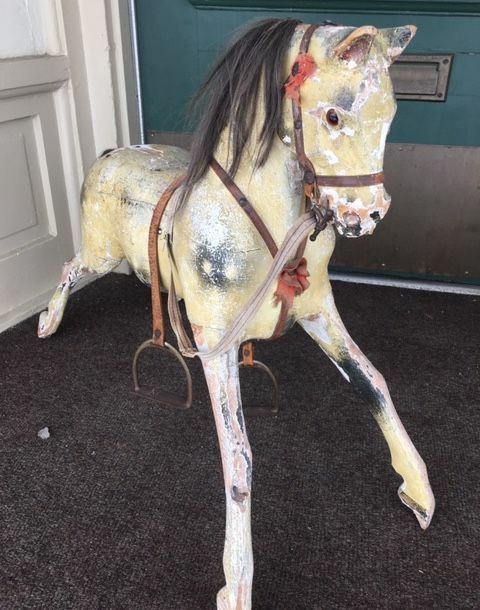 Rocking horse in original paint decoration, late 1800s, retaining remnants of tack and original horsehair mane and tail, rockers lost. 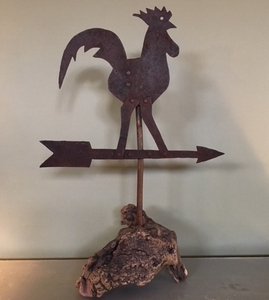 29" long x 24" tall. 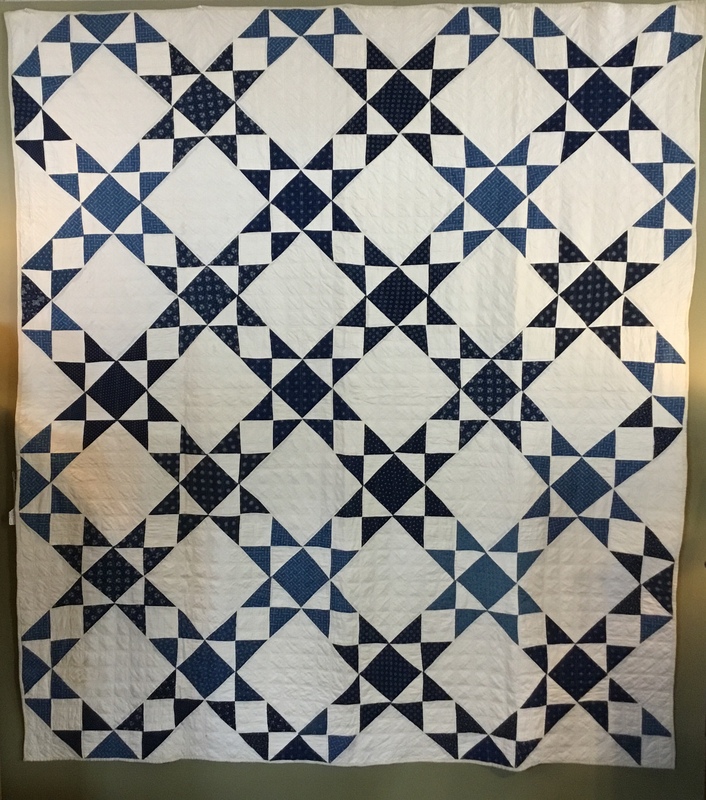 Indigo and white 8-point star variation quilt, circa 1870, 69" x 76", wonderful indigo prints, double line quilting, excellent condition. 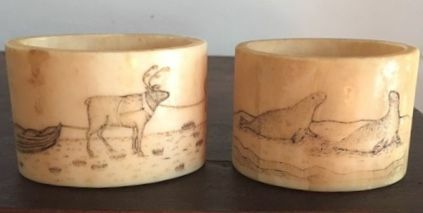 Pair of well-executed scrimshaw napkin rings in excellent condition, circa early 1900s. 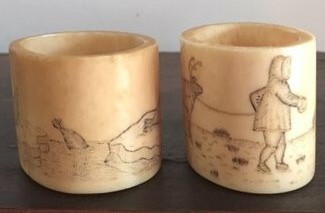 Sizes don't match, as expected. 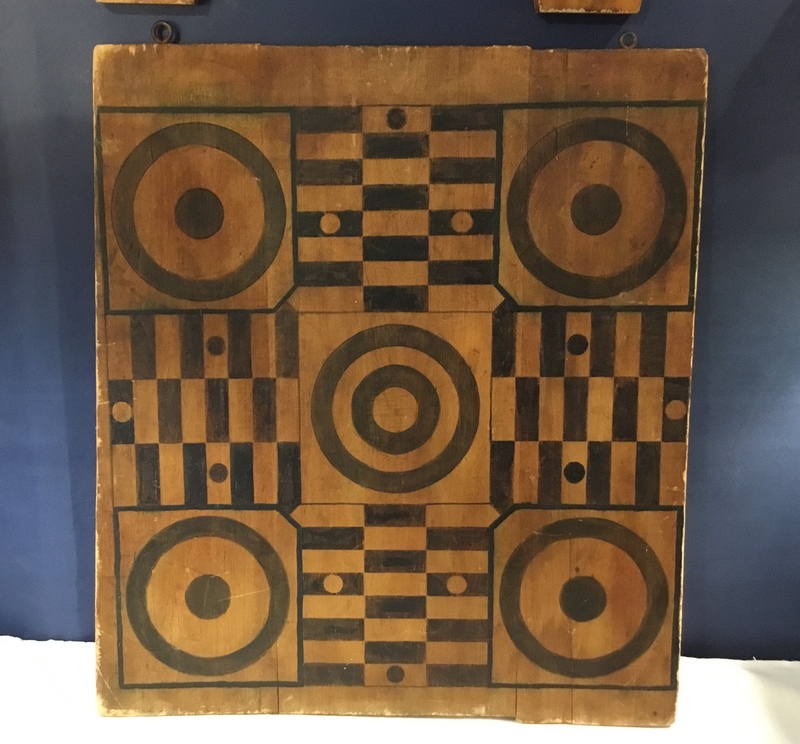 Graphic Parcheesi game board in original black paint decoration, circa 1900, original eye hooks. 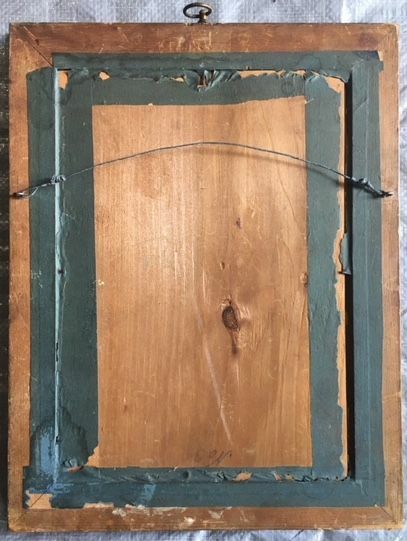 22 1/2" x 20". 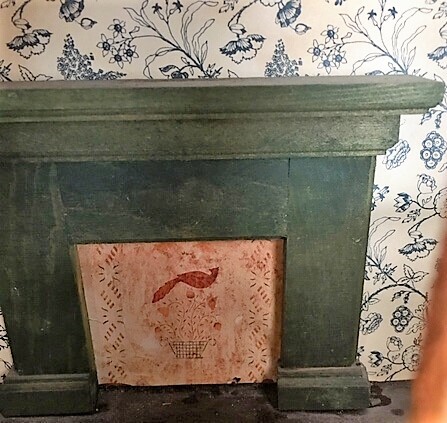 Small dollhouse featuring window boxes, interior mantle, painted bird in fireplace, wall portrait, period wallpaper, 13 3/4" x 11 7/8" deep x 13" tall. 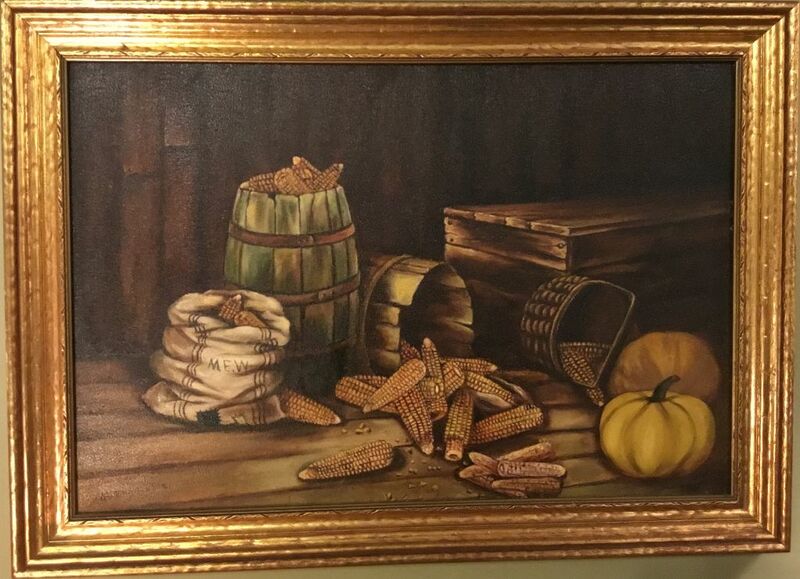 Corn painting in the style of Alfred Montgomery, signed M. E. Williams, probably his pupil, circa 1900, 21" x 15", excellent condition. 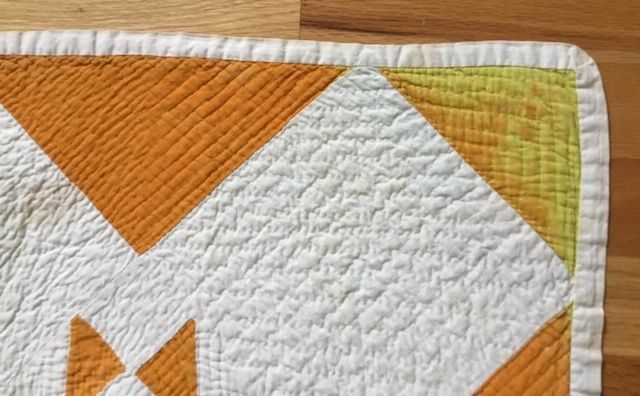 Rose Wreath appliqu� quilt in yellow/gold, orange, and teal with swag border, circa 1930, exquisite quilting at 12 stitches per inch, superb appliqu� with tiny stitches, excellent condition, large size suitable for a king bed at 96" x 11o". 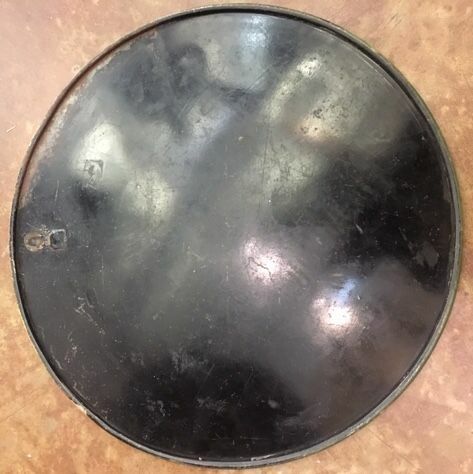 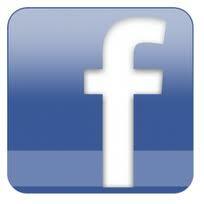 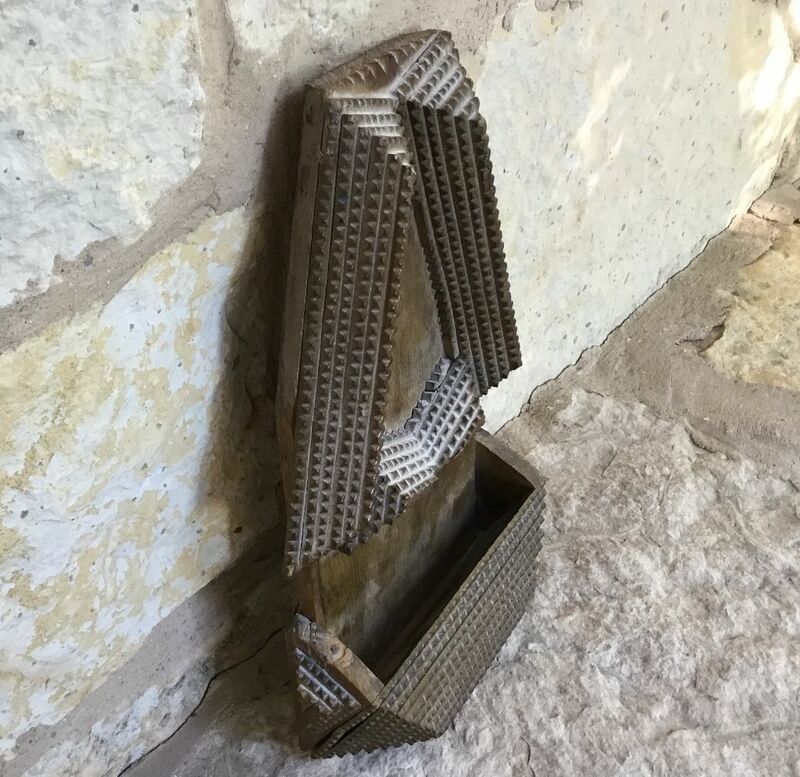 25 1/2" x 18", excellent condition. 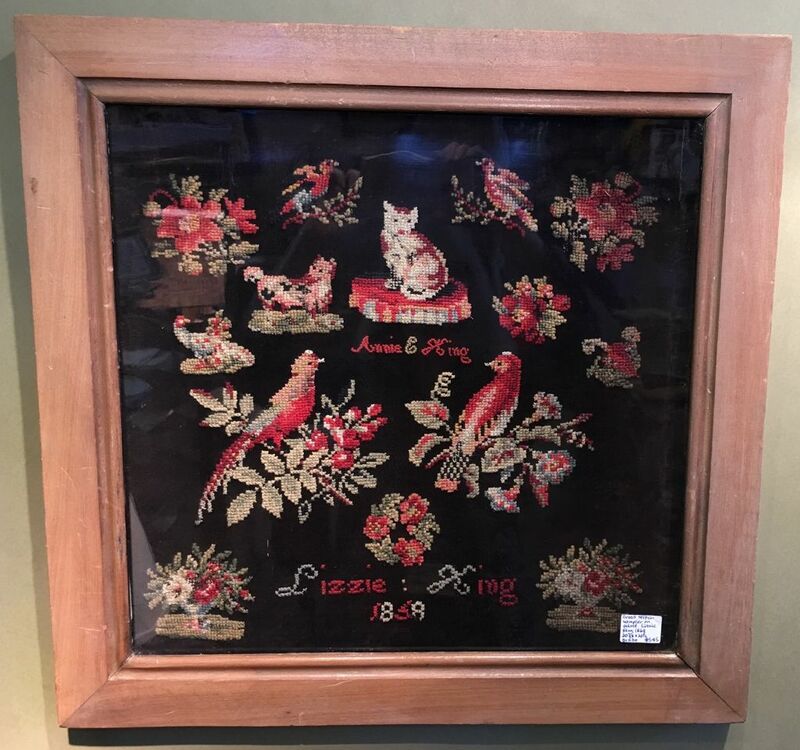 Cross stitch sampler on black velvet, with cat, dog, birds, cornucopias, and wreaths and urns of flowers, "Annie E. King, Lizzie King, 1868", 20 7/8 x 20 1/2". 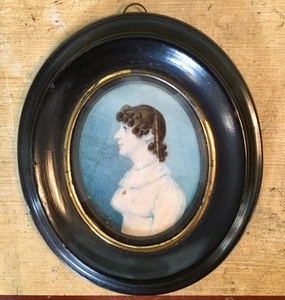 Excellent color and condition (discolorations are artifacts of photography). 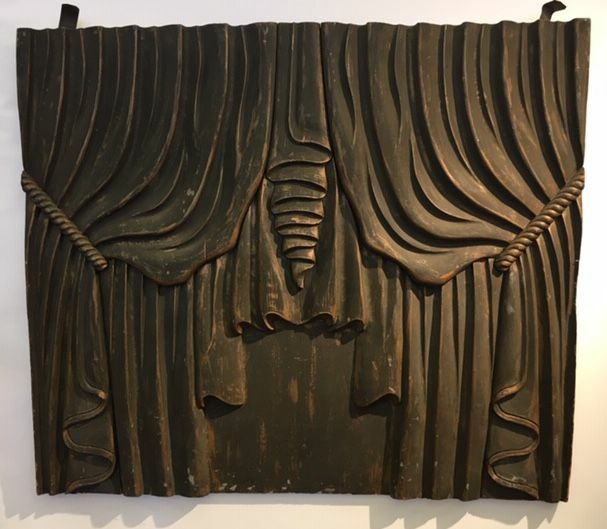 Carved funeral wood panel from 1870s horse-drawn hearse, expertly carved in original black paint with traces of gold, excellent condition, 33 1/2" x 29" tall. 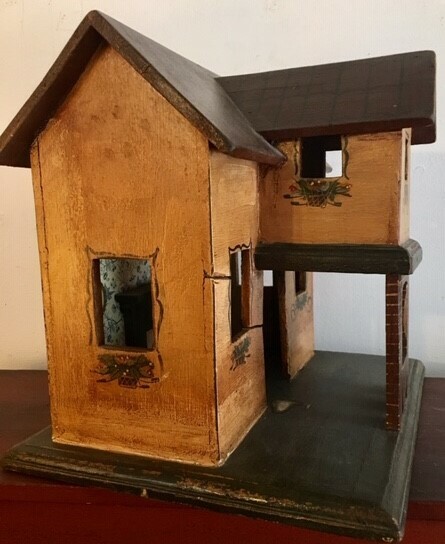 Tramp art wall box in original paint and excellent condition, circa 1920. 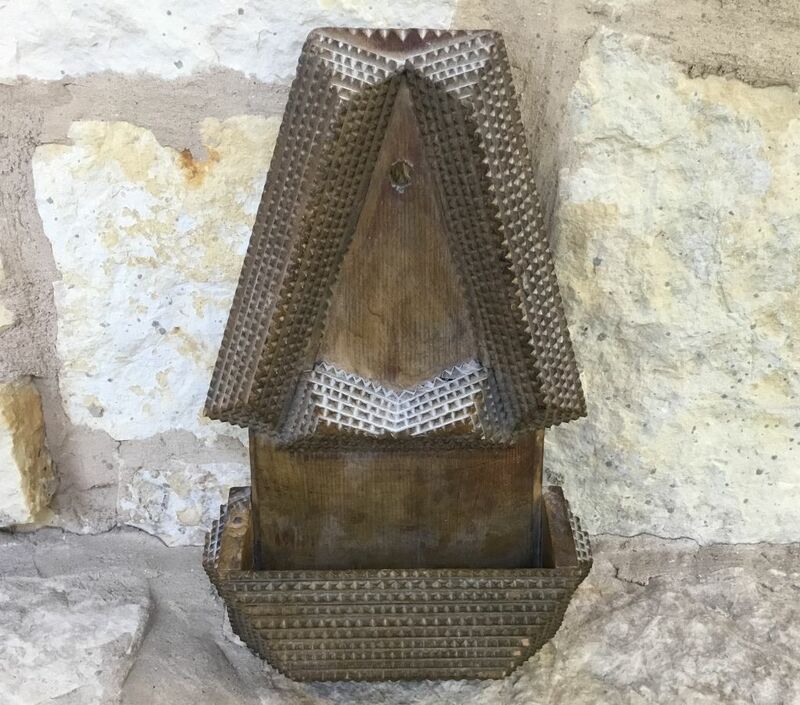 13 5/8" tall x 8 1/2" wide. 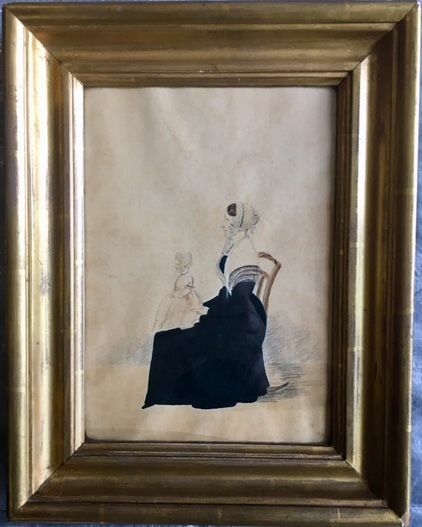 Watercolor of mother and child in original gold frame, mid 1800s, 13 3/4" x 11". 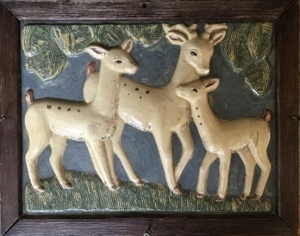 Glazed clay tile of three deer, circa 1920, framed, 17 3/4" x 14" x 1 1/4" deep. 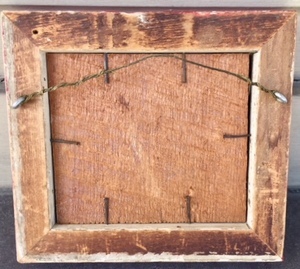 4 3/4" x 4 1/8". 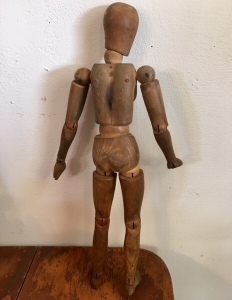 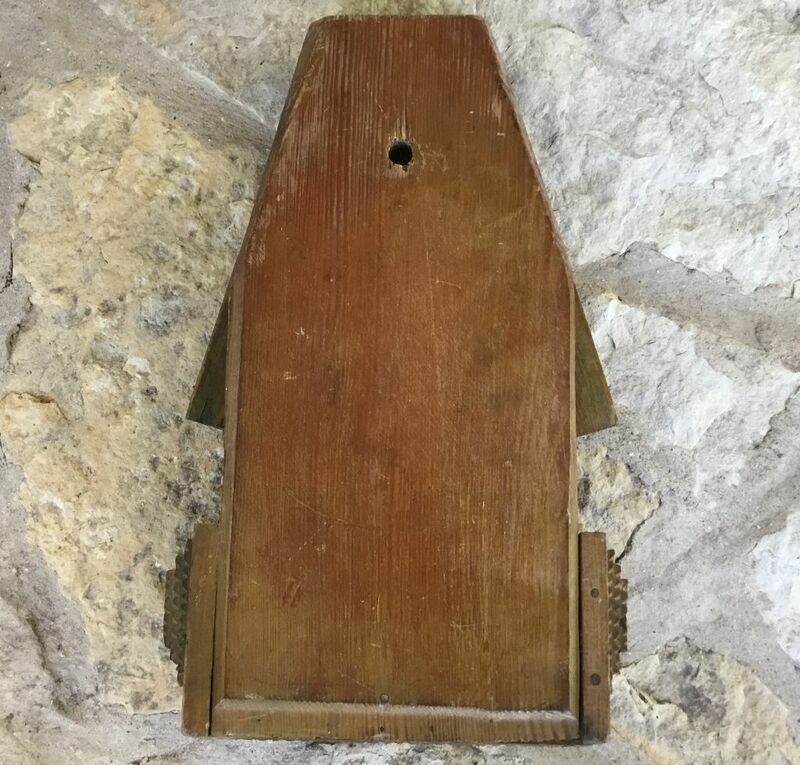 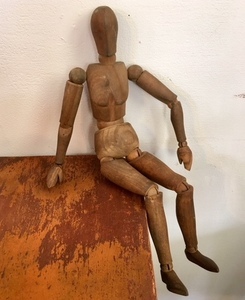 Artist's model, fully articulated with screws and wood pegs, circa 1930, 13" tall. 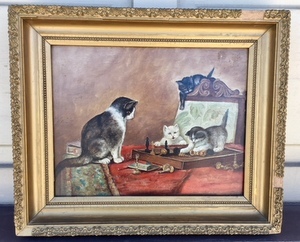 Cats playing chess, oil on board in excellent condition, some losses on frame. 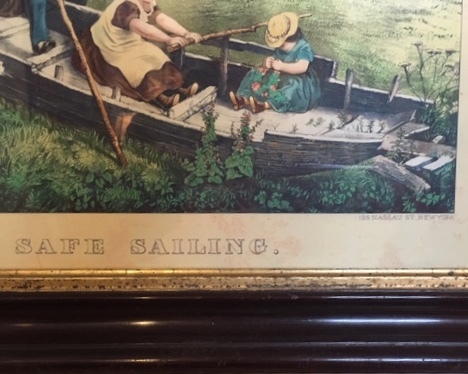 Copied from a Met Life ad circa 1870-80 (attached). 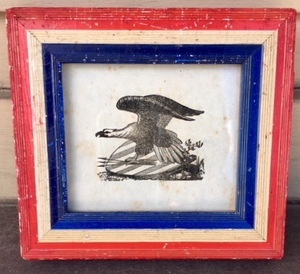 Small eagle lithograph in patriotic frame, original paint, circa 1920, 5 5/8" x 5". 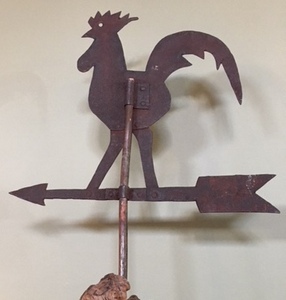 Sheet iron rooster weathervane on burl base, early 20th century, 24" tall x 16" wide x 10" base.